On Design Santa Barbara we cover one of are favorite topics, Art. On this episode of “Great Artists” we talk about a very talented artist who once lived, Frida Kahlo. A Mexican artist who painted many portraits, self-portraits, and works inspired by the nature and artifacts of Mexico. We also welcome Frank Goss who owns and operates Sullivan Goss Gallery . An American Gallery with his wife, Patricia Sullivan Goss. As a principal of the firm, he buys and sells works of art, makes decisions about which estates the gallery will acquire, curates exhibitions, and plots the direction for the company’s future. Lastly, on Design Santa Barbara we recap a local artist, Ralph Waterhouse who is a painter and gallery owner. The first artist we cover on Design Santa Barbara is Frida Kahlo de Rivera. Inspired by the country’s popular culture, she employed a naïve folk art style to explore questions of identity, postcolonialism, gender, class, and race in Mexican society. Her paintings often had strong autobiographical elements and mixed realism with fantasy. In addition to belonging to the post-revolutionary Mexicayotl movement. Which sought to define a Mexican identity, Kahlo has been described as a surrealist or magical realist. On September 17, 1925, Kahlo and her boyfriend – a fellow Cachucha, Alejandro Gómez Arias – were on their way home from school when the wooden bus they were riding collided with a streetcar. An iron handrail impaled her through her pelvis, fracturing the bone. She also fractured several ribs, her legs, and her collarbone. She spent a month in the hospital and two months recovering at home. Furthermore, before being able to return to work. As she continued to experience fatigue and back pain, her doctors ordered x-rays. Which revealed that the accident had also displaced three vertebrae. Her treatment included wearing a plaster corset, which confined her to bed rest for part of the three months she spent unable to walk. The accident ended Kahlo’s dreams of becoming a doctor and caused her pain and illness for the rest of her life. During her recovery, she started to consider a career as a medical illustrator. Which would combine her interests in science and art, and began to paint. She had a specially-made easel that enabled her to paint in bed, and a mirror was placed above it so she could see herself. 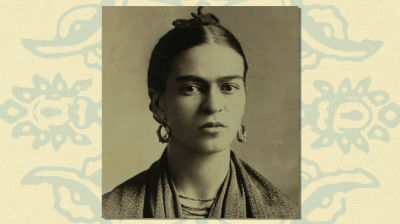 Painting became a way for Kahlo to explore questions of identity and existence and she later stated that the accident and the isolating recovery period made her desire, “to begin again, painting things just as I saw them with my own eyes and nothing more.” In addition most of the paintings Kahlo made during this time were portraits of herself, her sisters, and school friends. Kahlo soon began a relationship with Diego Rivera, despite his being 42 years old. Furthermore having had two common-law wives, and being a self-confessed womanizer. Her mother was against the marriage, and both parents referred to it as a “marriage between an elephant and a dove”, referring to the couple’s differences in size. Rivera was tall and overweight while Kahlo was petite and fragile. Regardless, her father approved of Rivera, who was wealthy and therefore able to support Kahlo. In this case, who could not work and had to receive expensive medical treatment. Second on Design Santa Barbara we welcome Frank Goss who owns “Sullivan Goss“. An American Gallery that has represented the work of American artists for 30 years. With an inventory of over 3,000 works, including paintings, watercolors, drawings, prints and sculptures, Sullivan Goss is the primary West Coast gallery positioned to help build private and public collections of important American art. The gallery is constantly seeking to acquire works by significant American painters and sculptors who worked between 1850 and 1950 including those artists referred to as luminists, impressionists, expressionists and modernists. Originally from England, Ralph Waterhouse is a painter and gallery owner whose paintings have been described as having a feeling of serenity which reflects his love of the natural environment. leading to international recognition. Ralph has participated in many one-man and group shows in United States and Europe, some of which have raised money for environment. of his paintings as a memory of her visit to California. Ralph is currently working on several Large commissions of thr Santa Barbara landscape for Santa Barbara Bank & Trust.